Only 4 days till Neverwinter Nights: Enhanced Edition launches on Steam! 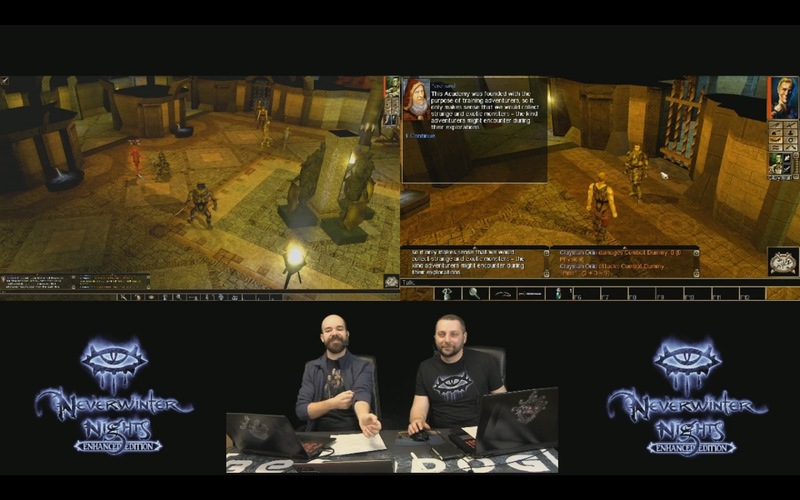 During today’s Beamdog livestream, Studio Director Phillip Daigle and Neverwinter Nights: Enhanced Edition product owner Jonathan Hill shared the latest NWN:EE and Infinity Engine news. Jonathan and Phil played Neverwinter Nights: Enhanced Edition together and discussed what’s to come for NWN:EE on March 27. It’s the last day of the Siege of Dragonspear Collector's Edition sale! 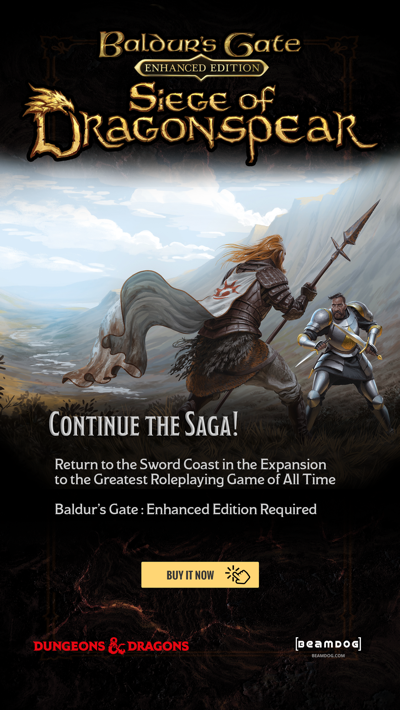 Order it on beamdog.com for just $99.99 USD. You now can buy Planescape: Torment: Enhanced Edition from the Twitch store! All our Infinity Engine titles are currently on GOG’s Greatest Stories sale! To celebrate the March 27 Neverwinter Nights: Enhanced Edition launch on Steam, we’ll be hosting a 2-hour livestream with guests, contests and prizes! Tune in at 10am PT. On April 1 there will be a special livestream where Phil and some of the Beamdog team will reveal a secret project! The 2.5 patch updates for Baldur’s Gate: Enhanced Edition and Baldur’s Gate II: Enhanced Edition are still in the works. 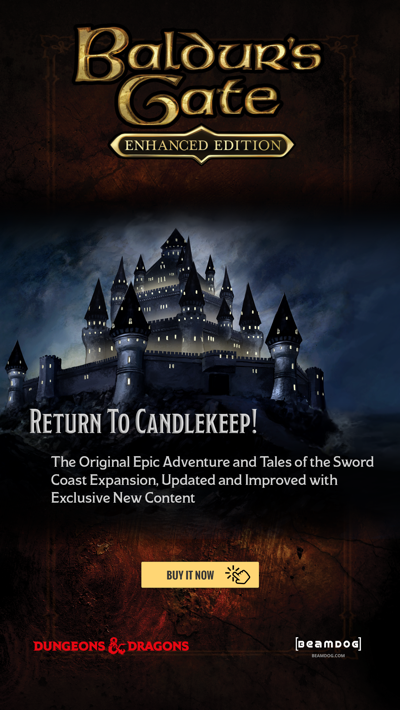 We’re a little held up due to the upcoming launch of Neverwinter Nights: Enhanced Edition, and some hotfixes were needed for Siege of Dragonspear on mobile devices, but the 2.5 patch updates are coming! Localization updates are currently being tested internally. 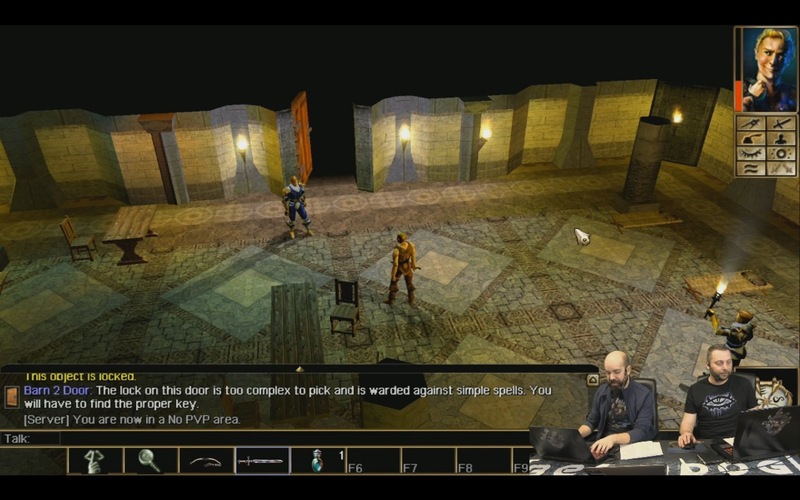 Build v8166 for Neverwinter Nights: Enhanced Edition has just been released. This patch focuses on camera, audio and part-based item/character issues. Check out the full patch notes here. At 1080p, Phil’s UI scaling (left) is set to 1x while Jonathan’s UI scaling (right) is set to 2x. The Roadmap and Input Trello boards for Neverwinter Nights: Enhanced Edition will continue after NWN:EE releases on Steam. They help us hear what the community think. We work directly with the community - if you have an idea about Neverwinter Nights: Enhanced Edition, share it on our forums, and vote for features you like on the Input board. Steam Workshop already has an amazing amount of community created content for Neverwinter Nights: Enhanced Edition. It works seamlessly with Neverwinter Nights override folders structure, just subscribe to the content you’re interested in, and it downloads automatically. Our number one rule for NWN:EE is not to break backwards compatibility. The Hall of Justice and sample character model from the tech demo are both available on Steam Workshop! Play with them, use them in mods, have fun! Neverwinter Nights Vault is another place to look for custom content. It’s a real treasure for all Neverwinter Nights fans! Phil (left) is using old character heads, while Jonathan (right) has downloaded a model from Steam Workshop. No matter which model you choose, you can play the same game together! There currently is no release date for Neverwinter Nights: Enhanced Edition on GOG. 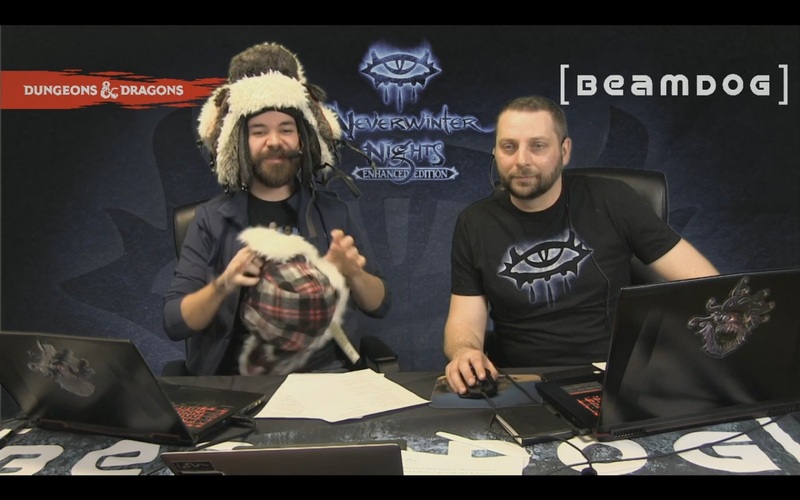 After NWN:EE launches on Steam we’ll continue rolling out frequent development branch patches. We want to let players move different interface windows as they wish and we’ll be opening up UI for modders. According to Jonathan, the more we unhardcode UI, the better. How many magic caps did Phil get? 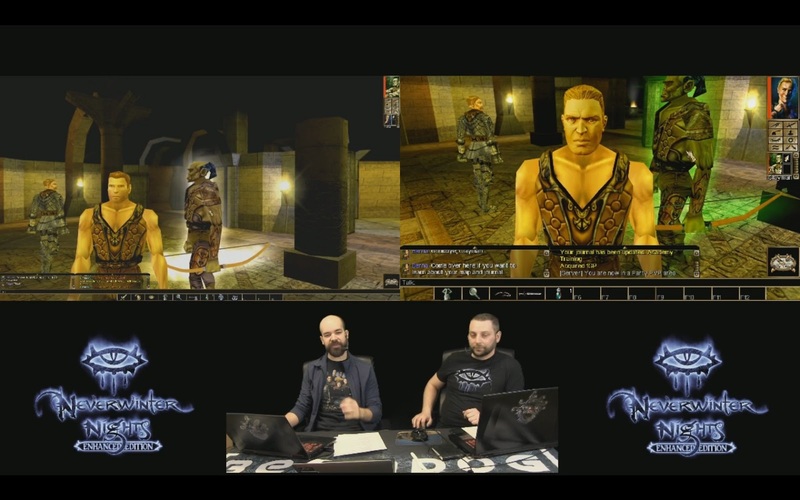 Excited for Neverwinter Nights: Enhanced Edition? Come and join the launch livestream on Tuesday, March 27, at 10am PT! "Come and join the launch livestream on Tuesday, March *23*, at 10am PT!" Looks like Julius Borisov suffered from a case of the typos! Someone might want to correct that, to avoid confusion!